Vishnu's Butter-ball, Seven Pagodas [Mamallapuram]. Height = 25ft, greatest circumfce. 68ft, circumfce. of base = 19Ã?Â½ft. bl.uk > Online Gallery Home	> Online exhibitions	> Asia, Pacific and Africa Collections	> Vishnu's Butter-ball, Seven Pagodas [Mamallapuram]. Height = 25ft, greatest circumfce. 68ft, circumfce. of base = 19Ã?Â½ft. 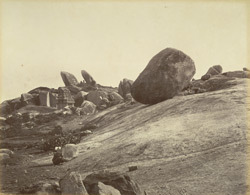 Photograph taken by Nicholas and Company in the 1870s, showing the massive rock popularly called Krishna's Butterball at Mahabalipuram (Mamallapuram) in Tamil Nadu. The Ganesha Ratha temple can be seen in the background. A huge monolith incredibly poised on a sloping granite slab, the Butterball stands out even in the rocky terrain of Mamallapuram. Now a sleepy village, Mamallapuram was once the port city of the Pallava dynasty which dominated south India between the 4th to 9th centuries AD, with their capital at Kanchipuram.